Keri Geiger, a Nurse from the United States working for Médecins Sans Frontières (MSF), in the Central African Republic (CAR). Keri arrived in Zemio, in the far southeast of the Central African Republic, in April 2016, a large community with a population of around 17,000 people. In Zémio, in the far southeast of Central African Republic (CAR), Doctors Without Borders/Médecins Sans Frontières (MSF) has partnered with the local Ministry of Health (MoH) to support a 30-bed health center with inpatient, outpatient, maternity, laboratory, and HIV/TB services, and runs an outreach program. The project started in 2010 in response to a large influx of Congolese refugees, as well as internally displaced people who were forced out of their homes due to repeated violent attacks by the Lord’s Resistance Army (LRA). The Zémio Health Center remains one of the only secondary care facilities in this rural region and receives patients from as far as 155 miles away. Keri Geiger, an MSF nurse from the USA, shares the stories of patients from the HIV program in Zémio. Gisèle has lived her entire life in Zémio, as have her parents. Though her father has passed away, she still lives with her mother right next to the Zémio Health Center. Back in 2008, before MSF had come to Zémio, the health center was run by the Central African Ministry of Health (MoH). During that time, Gisèle became very sick. Her abdomen was constantly bloated and she suffered from severe fatigue. When she finally stopped getting her periods, she decided to go to the health center for help, and that’s when she learned she had HIV. "I used to be tired all the time. I couldn’t work. I didn’t feel well," Gisèle told me. But the physical problems weren’t the worst part of HIV. "My father’s family abandoned me when they learned I was HIV positive," she said. Only her mother stayed with her. "With this disease, I lost everything in my life that was going well." Fortunately, the MoH doctor who worked at the Zémio Health Center helped her start antiretroviral and co-trimoxazole treatment, and, little by little, she began to feel better. Her health improved and she started to see that life with HIV is possible. But living in CAR has its own challenges. In 2010, Gisèle’s doctor was killed by the LRA. Her access to treatment was cut off. For the next year, Gisèle searched for another way to get her medications. 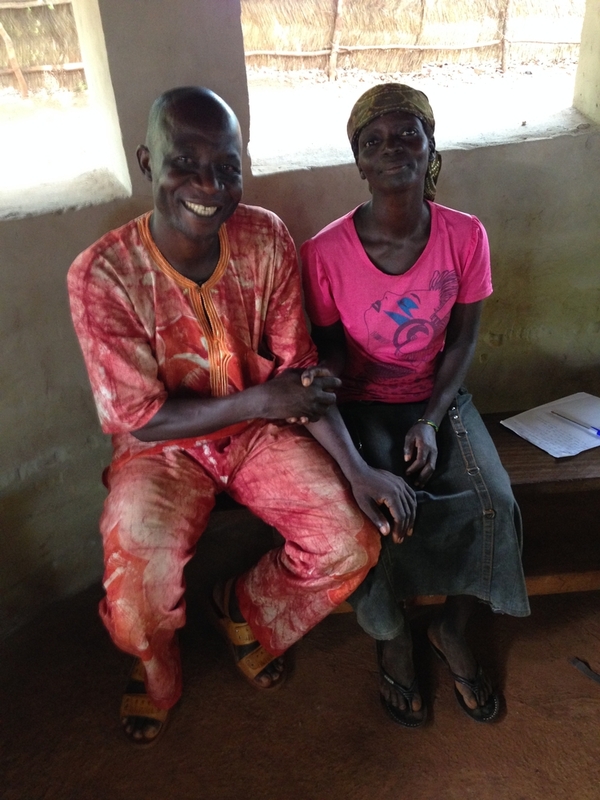 She went to other villages, to other health posts, but none of the medications they gave her worked. She was at a loss for what to do next, and she felt as bad as she had before she ever started treatment. When MSF came to Zémio and opened the HIV program, Gisèle was one of the first patients. She re-started her antiretroviral treatment and immediately began to feel better. "Sometimes the medications make me tired, but when I take them like I am supposed to, I feel like I am in good health," she says. Gisèle has now been under MSF care for 5 years, and she has never had a problem with taking her medications because she knows that they have saved her life. "Sometimes people with HIV get sick, but not if they take their medications well," she told me. "When you take the medications like you’re supposed to, you can stay in good health." "Now I am strong. I am able to work for my church like I want to. I feel that now I have the strength, if only I had the money I could build my own house, my own bed." She lights up when she tells me about her work. It’s clear that she loves being a part of this community. Gisèle is a regular attendee of the HIV support group at the Health Center. She tells me that the support group is good, but it is not enough. She feels that the community still lacks knowledge about HIV and more could be done to engage people in a discussion about the disease. "We need people to understand what it’s like to live with HIV," she says. But for now, Gisèle is happy simply share her story with me. "I’m happy to talk to you about this anytime," she assured me. "I’m always available to help you. It’s because of MSF that HIV positive people in Zémio can continue to live." MSF first worked in CAR in 1997, at a time when mortality rates in some regions were up to five times the emergency threshold. In the years since, CAR has continued to face a situation of chronic and prolonged health emergency. Since 2013, the political crisis and renewed violence have shaken the country, exacerbating the health situation, and leaving 72 percent of the country’s health facilities damaged or destroyed. In response to the recent crisis, MSF has doubled the size of its medical response, and now runs 17 projects across the country. Currently, one in five Central Africans are displaced from their homes, either within CAR or living as refugees in neighboring countries. Read More: "Life is Always a Struggle, but There are Moments of Happiness"